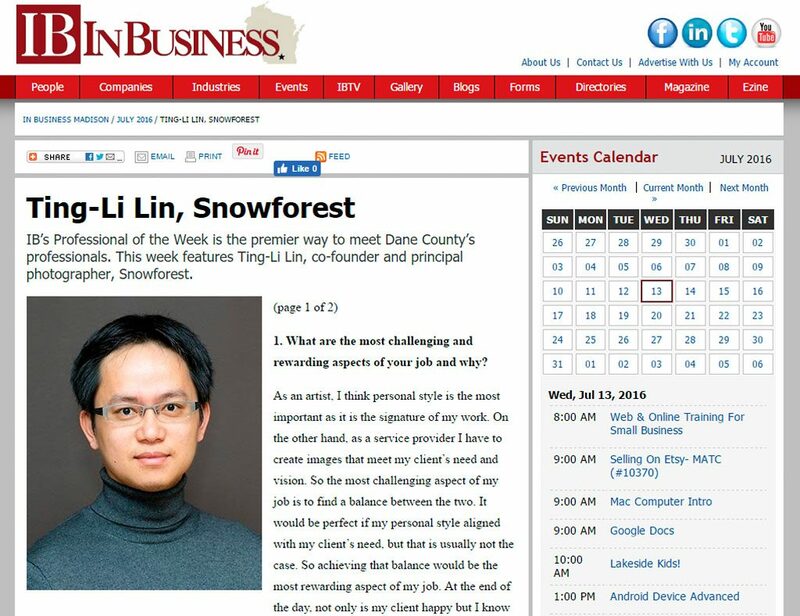 It’s an honor to be selected as In Business Madison Professional of the Week for this week. The original article is here. Below please find my answers to their questionnaire. As an artist, I think personal style is the most important as it is the signature of my work. On the other hand, as a service provider I have to create images that meet my client’s need and vision. So the most challenging aspect of my job is to find a balance between the two. It would be perfect if my personal style aligned with my client’s need, but that is usually not the case. So achieving that balance would be the most rewarding aspect of my job. At the end of the day, not only is my client happy but I know I have extended my artistic vision to the project. Yvon Chouinard, the founder and owner of Patagonia. I admire his vision of providing high-quality products while maintaining environmental consciousness. His company takes care of its employees, and for working families they have been providing on-site childcare since 1984. Moreover, they have been using organic cotton exclusively for their cotton products since 1996 and keep doing research on recyclable materials for their products. They even teach their customers how to repair their clothing once damaged instead of buying new ones. I would suggest everyone read his book, Let My People Go Surfing. It is truly inspiring. As a photographer, winning first prize in the Ansel Adams Gallery National Park Photography Contest in 2009 was a high point of my career so far. The winning photo was in my photo exhibition at Gallery 800 UBD in 2014. Focus on one or two things that you are really passionate about. Do not be distracted by other interests or hobbies. I am not saying that other interests or hobbies are not important, but I have a record of having too many interests. So narrowing them down to one or two would have been very helpful in staying focused because there are only 24 hours a day. 5. What would you say are the best things about living and working in Dane County? The best things about living and working in Dane County, especially in the Madison area, are that it provides big-city convenience without big-city expenses. There are lots of activities for families. The school system seems to be very good. It’s a great place to raise my kids. 6. Do you have any secret talents or abilities that people would be surprised to discover? I started curling in 2001. I am currently a member of Taiwan’s national curling team and have competed in the Pacific-Asia Curling Championships in 2008, 2009, 2014, and 2015. The team is based in Vancouver, and I am the only one who does not live there. 7. What are your guilty pleasures? I like donuts, especially those from Lane’s Bakery. I also like pineapple cakes from Taiwan. I can finish a dozen of them in no time. So some of my friends always associate me with these two things. Back in the graduate school, I could have them for breakfast, lunch, and dinner, and call it a day.